Origami, the Japanese art of folding paper. Beautiful things created from humble material. My folding skills never went further than making paper darts or folding restaurant napkins into tumescent shapes whilst waiting for pudding to arrive. But I appreciate the craft. 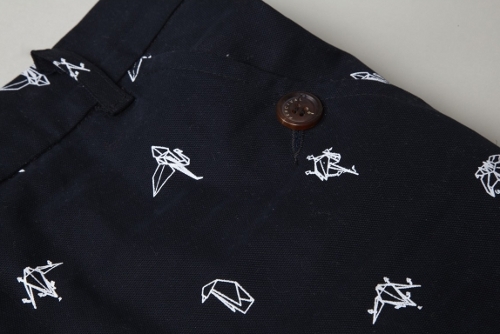 Likewise with these origami-print trousers from Percival Clothing. 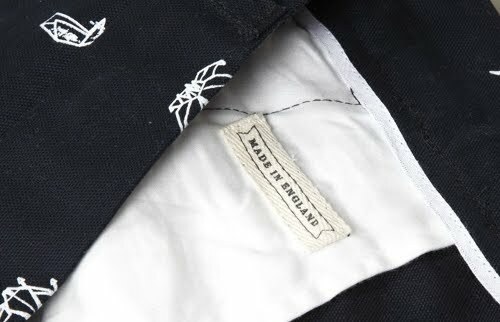 The trousers are made in England in navy canvas that has been hand screen-printed with origami detail. Quite unique. I see you wearing these trousers on the coast, maybe tucking them away for a trip to Nantucket Harbour (US) - and giving Murray's brilliant embroidered 'pants' a run for their money - or Dartmouth (UK). Perhaps you could throw an Aran jumper on top.